Area and Climate: Peru, Ecuador, Spain, Portugal, New Zealand and Australia. In elevated and fresh areas, with warm, sunny climates. Similar species: Annona diversifolia (Ilama). Related species: Annona muricata L. (Soursop, Guanabana), Annona squamosa L. (Sugar apple). Smooth, great, very smooth skin, visible seams between the carpels, but with no lumps. Printed, big, scaly skin, sweet flesh, juicy, with few seeds. The seams between the carpels protrude slightly,They are sunken in the middle. Mammillata, medium size, and thick smooth skin. Juicy, aromatic and with very few seeds. The seams between the carpels stick out creating large bumps. Tuberculata, medium, and dark skin that takes long to mature. The connections between the carpels are very pronounced, the more it grows, the larger its protuberances form. Umbonata, medium, fine and delicate skin, juicy flesh and lots of seeds. The joints between the carpels stand out, creating small bumps. It is a large and rounded fruit, like a heart. It can weigh up to a kilo. It has a thick but not hard skin, with scaly appearance and light green color at the time of being collected. Between 2 and 4 days at room temperature make the skin to become yellowish. The interior however is white or light ivory. 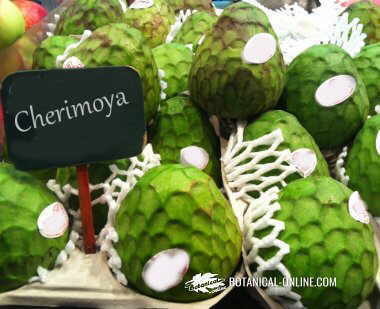 Cherimoya tastes differently to the rest of fruits, quirky, sweet with a touch of acidity which is very appreciated, like a mix of pear, banana and cinnamon. Its texture is creamy and, when ripe, it can be eaten easily with a spoon. The interior contains several black seeds, 1 centimeter in size. It is usually eaten in autumn. * Related information : Nutritional composition of the cherimoya.